There is a nice shopping mall about 2 hours away that I visit when I have to go to a mall. Well, truth be told, I probably only shop at Williams-Sonoma there, unless I’m Christmas shopping. Then I’m a bit more adventurous. The mall has a nice restaurant that I go to because of the convenience. But it’s good! You’ll all probably be shocked that it’s a chain restaurant, called Pepperoni Grill. The menu is nice, the restaurant is always clean, and the service great. Surprisingly great. Oddly enough, I’ve always ordered the same thing, which is a warm Mediterranean Tortellini and Vegetable salad, served with a creamy balsamic vinaigrette. I say this is odd, because typically, I would order something new on the menu. But, after 20+ years, I keep ordering this salad. It’s so good, so well prepared, and so satisfying. Then I had the brilliant idea to replicate the salad at home. It doesn’t look exactly the same because the restaurant uses tricolor tortellini, but mine tasted just as good! Being that it’s not springtime, I opted for green beans instead of asparagus. To prepare the vinaigrette, place all of the ingredients in a small blender jar. Blend until smooth. Taste for salt. Can be made a day ahead, but bring the vinaigrette to room temperature before making the salad. The vegetables must be prepared separately for the salad, in order to have them all at the proper cook. It’s also best for all of the vegetables and the tortellini to be warm when served, so one must move quickly! In a steamer basket, cook the potatoes just until tender. Place in a large bowl, toss with a few tablespoons of vinaigrette, and set aside. If you don’t like a lot of dressing, use some olive oil instead. Cook the green beans in the steamer basket and add them to the potatoes. Toss together gently, adding a little more vinaigrette to keep the vegetables moist. Do the same with the yellow squash, making sure not to overcook. Add to the potatoes and beans. Cook the cheese tortellini according to package directions. Drain and let cool slightly. Add the still warm tortellini to the vegetables. Add the desired amount of vinaigrette and and toss gently. Add the sun-dried tomatoes and olives to taste. Then sprinkle on a generous amount of Parmesan. No mixing necessary. I like a lot of vinaigrette on my salads, but I’m aware that not everyone does. So when I suggest to add the desired amount of vinaigrette, that’s exactly what I mean! My mother’s secret to a good potato salad was to always add some olive oil to the warm, just-cooked potatoes. So that’s what I did in this salad, using the vinaigrette instead of just olive oil, as well as adding some vinaigrette to the cooked tortellini. This keeps them moist and prevents sticking. In anticipation of making this salad, I googled it to see if I was making something fairly unique or not. Turns out, there are tortellini/pasta salads, and there are potato salads. This salad really combines the two – a pasta salad with a significant amount of veggies. The vegetables are along the lines of “primavera” vegetables, and can definitely be changed depending on what’s in season. Zucchini, broccoli, baby carrots, asparagus… all would be good. They could be grilled as well. And of course this salad would be wonderful with grilled meat, but I prefer it the way it is. So would I visit Pepperoni Grill for a special night out? No. But the fact that I can expect quality with what I’m ordering and enjoy a leisurely lunch, with a decent glass of wine, during a day of shopping, is really nice. My friend has a fruit orchard. In spite of a late freeze, the cherry trees were prolific this year, and at the beginning of June I went over to relieve her of some cherries! Although there’s nothing much better than just popping a fresh cherry in your mouth, I decided to do something with these fresh cherries, but without baking the obvious pie. I thought about ice cream, but then I settled on an idea I’d spotted in a cookbook a while back – roasting the cherries. My friend told me to refrigerate them, as they’re easier to pit when they’re cold, so that’s where they went for a few hours. I sorted the cherries, throwing away any questionable ones, rinsed them and let them drip dry. My friend gave me another tip – how to pit the cherries without using the olive/cherry pitter. A paper clip! You insert one rounded end of a paper clip into the dent where the stem was, and simply “scoop” out the pit. This works especially well when the cherries are ripe. I love brie in general, but if you’ve never had a goat brie, you’re mising out! However, regular brie will substitute in this recipe. Melt the butter over low heat in a small saucepan. Add the cherries and sugar, stir gently and remove from the heat. Place the mixture in an oven-proof baking dish. Roast the cherries, watching them carefully. It should only take about 15-20 minutes. You’re not drying them, just caramelizing them. Remove the baking dish from the oven. Because these cherries were so juicy, I gently removed to cherries using a small, slotted spoon, and poured the remaining liquid in a small saucepan. I gently reduced the cherry juice until a syrup, then added the cherry syrup. I reduced a few minutes longer, then added the balsamic vinegar. Meanwhile heat the goat Brie ever so gently in the oven or microwave. You don’t want to cook the cheese, just begin the melting process. To serve, place the Brie on a serving plate and cover with the roasted cherries. After the reduction has cooled slightly, carefully spoon it over the brie and cherries. I also added a few sprigs of thyme, and served the brie with toasts. If the brie is nicely warmed, it should pour out of its casing when cut into. The cherry juice, reduction and molten cheese made a beautiful design that wasn’t anticipated! This hors d’oeuvre turned out to be one of the tastiest I’ve ever created, in my humble opinion. And, it’s beautiful. The ratio of ingredients will definitely depend on the sweetness and juiciness of the fresh cherries! As I mentioned in my strawberry vinegar post, a green salad topped with fresh strawberries is extraordinary, but only in the springtime when it’s strawberry season. Any other time of year it just doesn’t seem right to me. 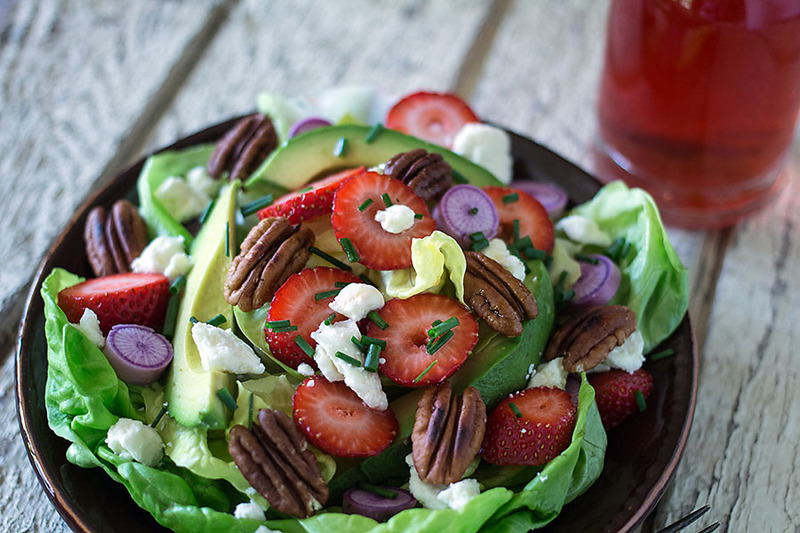 A green salad with strawberries is also very pretty. It was because of strawberry-topped salads that I was inspired to make a strawberry vinegar. I thought the layered effect of the strawberry-infused balsamic vinegar, along with the ripened strawberries would be a nice complement to greens. For some crunch, you can add toasted walnuts or pecans, like I did, and crumbled bleu cheese or feta for extra deliciousness. Today I chose feta. I also included avocado slices for protein, plus a few radish slices for even more color. But other than that, I kept the salad simple in order for the ingredients to shine. If you don’t have a strawberry-infused vinegar, but want to make the salad, I’d keep the dressing simple. No strong-flavored dressings, just oil and vinegar. But you have choices there as well. You can use a good olive oil, like I did, or even a nut oil, like hazelnut or walnut. These oils are not only for autumnal salads because their flavors are mild. Even an orange-infused oil would be good in this salad, since it’s also mild. Vinegar-wise, I’d use a light-flavored vinegar, like a red wine or apple cider variety. After one week of the fresh strawberries infusing white balsamic vinegar, it was time to decant. I tasted the vinegar first to make sure the flavor was right, and indeed it was. And just like the strawberry vodka I made last strawberry season, the color of the strawberries drained into the vinegar, so it’s really a lovely vinegar to use as well. If the strawberries hadn’t faded in color so much, I would have used them in a chutney, but they just weren’t pretty enough, as you can see in the above left photograph. For the salad, I used a butter lettuce – the kind that you can buy with the roots attached. I have some lettuce growing outside, but just not enough yet, thanks to our extended winter. I added the avocado, sliced strawberries, toasted pecans, and then sprinkled the feta on top. Then I simply drizzled olive oil and the strawberry vinegar on top. Plus a sprinkle of coarse salt. You can always add black pepper as well. Verdict: Fabulous! I will definitely keep making strawberry-infused vinegar and use it on my spring and summer salads. I can imagine it on grilled vegetables as well! There is one thing that makes me crazy at restaurants, and that is non-seasonal menus. It makes me want to go yell at everyone involved with the food and menu. And I’m not a yelling kind of person. Just ask my kids. Or maybe don’t. One menu item that infuriates me is a green salad topped with strawberries. In January. And it’s snowing outside. Why? And where are you getting these strawberries? And what are they costing you? Because they’re certainly not locally harvested in January. Not in the northern hemisphere. Strawberries are all about spring. Spring. Time. Add roasted butternut squash and warm lentils to your winter salad, maybe with some goat cheese. But save the strawberries for strawberry season. Speaking of strawberry season, the featured photo is of some of my just-picked strawberries from last year. I especially love the smaller, wild strawberries because of their sweetness and almost perfume-like quality. But you won’t find me putting any of my garden-ripened berries in vinegar or vodka. I like them just picked, warm from the sun, even if there’s still a little dirt on them. Store-bought berries are good for infusing vinegars and vodkas. As long as you can taste them and you know they’re sweet. A strong aroma is usually a good indication of their ripeness as well. And just as an aside, the sweet strawberry vodka from last spring is my most favorite infused vodka I’ve ever made. Check it out if you’re interested; there’s still time. But back to vinegar, I have actually never flavored my own vinegars. I typically add the flavorings when I make vinaigrettes. But in the spring, along with some fresh strawberries on a salad, I decided the layered effect of having a strawberry-infused vinegar was a must this year. Especially when just seasoning a simple salad with only oil and vinegar. No garlic, or mustard or other strong flavors to impede the deliciousness of strawberry. I bought a quart of good strawberries, gave them a slight rinse, then let them drip dry on a towel. I thought about mashing or even blending the strawberries to a pulp, but since I wanted the resulting vinegar to be clear, I decided to simply slice them. I placed the slices in a clean bottle with a wide neck, and added no more than 1 teaspoon of white sugar. Then, using a funnel, I poured white balsamic vinegar into the jar. I used 2 – 8.5 ounce bottles for the quart of strawberries. After giving the closed jar a gentle shake, I placed the jar in my pantry, and decided that one week should be sufficient, but I’ll give the vinegar a taste to see if a week is a substantial amount of time first. Stay tuned if you’re interested! Just in case you’re wondering, I chose a white balsamic instead of the traditional dark-brown color. I am a huge fan of balsamic vinegar – the aged and the less aged both. But they are brown. And this is just my personal opinion, but I have never liked the look of, for example, a pasta salad tossed with balsamic vinegar. It’s just not pretty. Since I wanted to use the strawberry vinegar for more than just my one salad in this post, I wanted it pink instead of brown. If you don’t love the sweetness of a white balsamic vinegar, simply use an apple cider vinegar, white wine vinegar, or a sherry vinegar.